Within central London, there are very few retreats from the ides of modern day city life. Spaces that feel as though they’re not within zones one or two on the tube map, and places that aren’t inhumanely busy at even the most unsociable hours. However, one of those very few spaces is Shad Thames – an area of the Southbank between Tower Bridge and the Rotherhithe Tunnel that houses a number of old warehouse conversions and restaurants, one of which being The Blueprint Café. 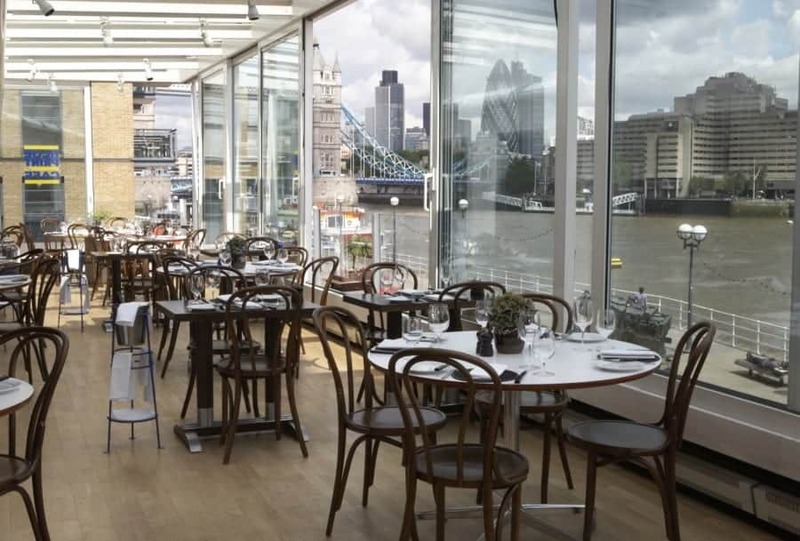 Located upon the first floor of the Design Museum, the dining space is punctuated by prominent floor to ceiling windows that peer out across a less-busy stretch of the Thames. To the west, a delightful view of Tower Bridge is on display, while eastwards the Isle of Dogs and Canary Wharf can be spotted in the distance. Having arrived for lunch at a quiet time, we were lucky enough to enjoy a window-side seat, with the view taking most of the sun-soaked dining space’s focus. As for the food, the menu has witnessed a recent overhaul, to tie in with the introduction of a new Head Chef – Owen Kenworthy, having previously worked in the kitchen of Columbia Road’s Brawn. Here, the new menu features a variation of European influences and a strong focus on fish and seafood. Nevertheless, to begin I’m unable to resist anything with a title quite so mysterious as ‘Piggy Treats’, not to mention the ideal promise of plenty of, well, piggy treats. Alas, the dish was served atop a slate much to my exasperation. I’ve never understood the appeal of eating from something that belongs either on the bathroom floor, or on the roof, and absolutely nowhere in between. And that’s without the spine-chilling cacophony cause by cutlery coming into contact with the pretentious makeshift plate. Fortunately, aside from a quenelle of rillettes that looked and tasted like a mound of raw sausage meat – the overall offering was particularly tasty, comprising a spear of wanton crackling, some delightful slivers of cured salami and a marvellous brawn croquette, almost like a scotch quail egg but without the egg, instead favouring braised meat from the pig’s head that’s slow cooked and laced with various vegetables. Annoyingly, my companion’s starter also arrived on something other than a plate. Instead, a wooden chopping board carried a jar of rich, creamy foie gras parfait topped with a decadent layer of butter and served with bread. Although not incredibly accomplished, the dish’s comforting quality and taste was superb. Next, a dish of calves’ liver was practically brilliant, served with a creamy celeriac puree and a deep, warming sauce. The liver, however, was considerably overcooked and thus dry. Although welcome by my companion, less enamoured by rare meats, I would have been less magnanimous had I ordered the dish myself, especially without any query towards personal preference. 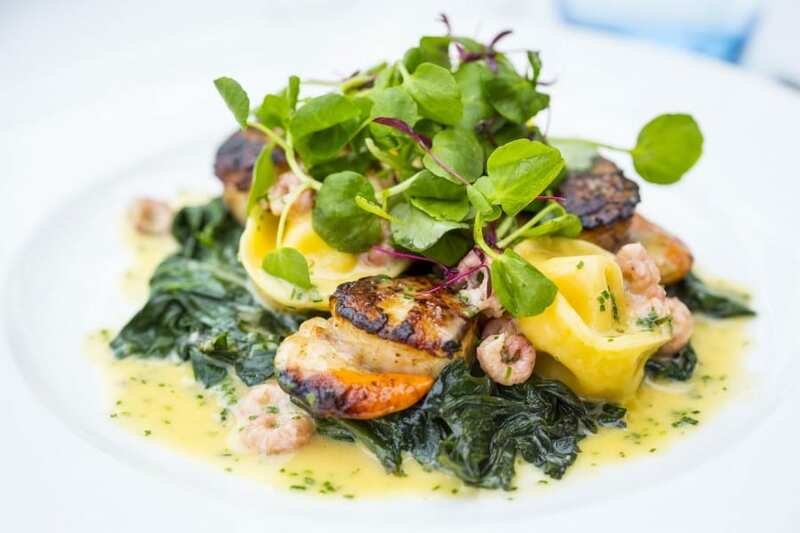 Auspiciously, my main was far better – including shells of al dente tortellini that had been packed with a mousse of scallop and Dorset crab, with the slight crunch of the pasta expertly contrasting the soft, unctuous filling, accompanied by shaved fennel and capers, with a luscious buttery sauce that delivered a binding depth. Torn between two desserts, our waiter insisted that I opt for a third party, promising that I’ll enjoy even though indifferent to chocolate-based desserts. He was right. Although alarmingly rich, a large portion of indulgent chocolate ganache was accompanied by a moreish pistachio cream and topped with a dollop of meringue. Although the meringue could have been far softer; the overall dish was a success. The same can be said for a slice of promising blood orange cheesecake with a citric flair that ripped through the sweetness of the cheese and thin biscuit base, working as an ideal palate cleanser. What’s most notable about The Blueprint Café, on the whole, is the surprisingly reasonable menu pricing: especially when compared to the many other local restaurants that boast panoramic views of the city. Teamed with a relaxed, casual atmosphere and food that’s for the most part very good – albeit safe, classic, and rarely mind-blowing – a slow-paced lunch at The Blueprint Café is a particularly congenial affair. The Blueprint Café can be found at Design Museum, 28 Shad Thames, London, SE1 2YD.